Born in 1978 in Blackwell, Oklahoma, Daniel Baldwin is quickly becoming one of the most highly sought after and widely performed composers in the world today. His music has been described as "epic", "refreshingly beautiful", "gorgeous and moving", and "beautifully inspired" by critics around the country. 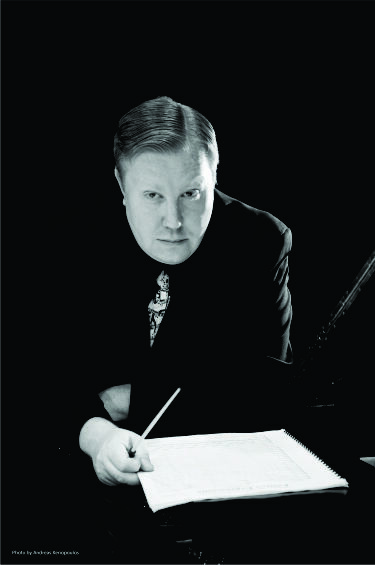 He is an award winning composer who has been commissioned by performers from the top orchestras in the world to include the New York Philharmonic, Chicago Symphony, and National Symphony Orchestra, among others as well as prestigious ensembles to include the Lincoln Symphony, Tulsa Symphony, Los Angeles Philharmonic, and the West Point Band. His music has been presented on National Public Radio, in prestigious venues around the world such as Carnegie Hall, the Walt Disney Concert Hall, and the Oklahoma Jazz Hall of Fame, on hundreds of University stages around the world, and at National and International conventions around the world to include the Masterworks Festival, Midwest Clinic, MENC National Convention, Kansas Bandmasters Convention, and at the International Festivals of the associations of Clarinet, Horn, Trombone, and Double Reeds, among others. An international composer, his music has been performed around the globe in Canada, Italy, Germany, Japan, China, Belgium, and Australia, just to name a few. His music is published exclusively by Imagine Music Publishing, through which he is the editor of a band/orchestra/choir series titled "The Pathways Series". A frequent guest conductor, he has conducted honor bands across the Midwest and double reed festivals across the country. He has conducted ensemble recitals at the Society of Composers Region VI conference (Rice University), the International Double Reed Convention (New York University and the University of Arizona), and the International Horn Symposium (the Colburn School). He holds the degrees of Bachelor of Music in Education from Northwestern Oklahoma State University in Alva, OK, Master of Music in Composition with an emphasis in Wind Band Conducting from Kansas State University, and a DMA in Composition with an emphasis in Orchestral Conducting from the University of Nebraska in Lincoln. His primary composition teachers include Eric Richards and Craig Weston as well as additional studies with Max Ridgway and Eric Ewazen. His primary conducting teachers include Michael Knedler at NWOSU, Frank Tracz at Kansas State University, and Tyler Goodrich White at UNL.